I have just returned from my annual trip to Japan, which has proved to be extremely insightful. I had the great pleasure of meeting Prof Ishiguro in Osaka and the opportunity to see some of his current research in action. Ishiguro: Through his research, it is possible to gain a sense of Ishiguro’s motivation for creating android robots. He argues that society itself is responsible for shaping humans, therefore by using a combination of computers, motors, and sensors he is able to create androids that are capable of mimicking humans. So synergistic androids are created, that with exposure to language and HRI, are able to develop a personality, therefore making them as human as any other being that depends on exposure to language, society, others and interaction to shape who they are and who they become. In addition, robotic research enables us to gain further insights into the activities of the human brain, and therefore a greater understanding of cognitive neuroscience. In this way robots reflect the activity of the human mind which permit this understanding. 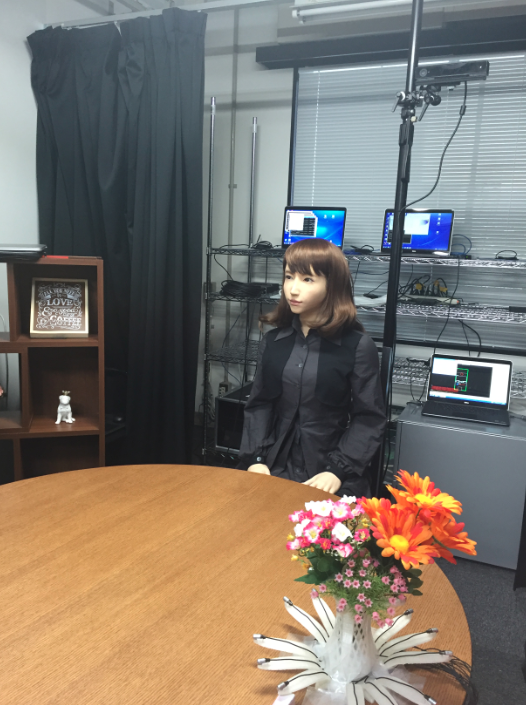 Robots in Japan: Japanese citizens openly accept robots and autonomous systems into their society so they don’t feel the need to distinguish the differences between them, and humans. Robots are considered beings, just like any other being, and take an active part in society in theatre productions, as caregivers, companions and shop assistants. Erica: Erica, one of Ishiguro’s projects designed as a research platform for an autonomous conversational android, uses voice recognition software to interact with humans. Unfortunately my Japanese is not proficient enough to have successfully interacted with her myself, but here is a short clip of her talking with one of Ishiguro’s research students. Intelligent microphones: Ishiguro is also working on intelligent microphones that would permit scheduled turn taking among robots, thereby releasing the pressure for humans to partake in interaction. From a pedagogical perspective this is a very interesting development for language training and the treatment and education of humans with communicational disorders like autism. Geminoid: When asked about the reaction of his students to learning with Geminoid, the responses were all positive. Japanese communication etiquette is an inherent part of the country’s culture. By teaching his classes via a tele-operated android doppelgänger, Ishiguro confirms that students feel less intimidated to ask questions and extend their enquiry, which they may not otherwise do with the professor himself. Ishiguro also confirms positive learning outcomes in European contexts (with 13 different nationalities) and is working alongside several European companies to bring these positive learning outcomes to a wider variety of contexts and nationalities. The current goal for me is to get my Japanese to a proficient enough level to be able to reap the rewards of HRI myself.